I went to Veneta, Oregon to play around on an outdoor trail course to try out some more 3 Minute Horsemanship. There were plenty of different obstacles that Lexi and I hadn’t tried before. She came out of the trailer relaxed, and we successfully accomplished all the obstacles that we attempted… until we tried the mailbox. 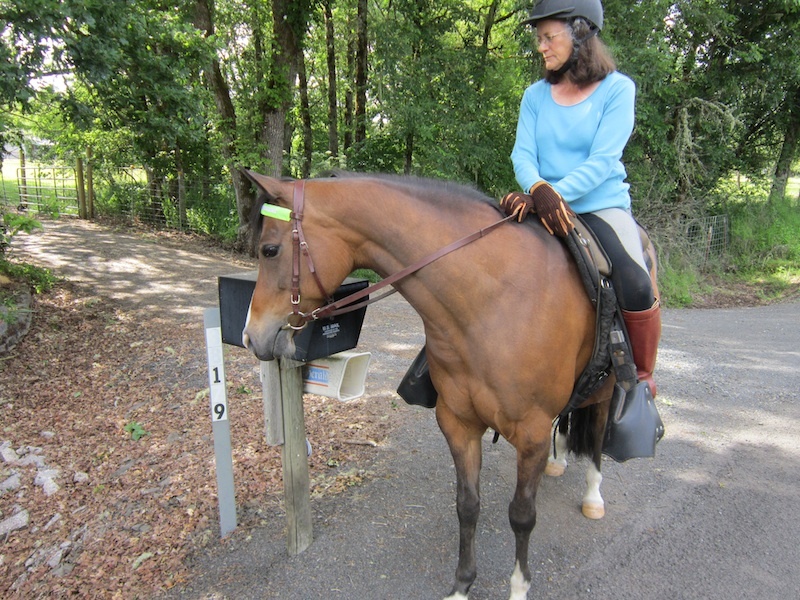 To complete this obstacle, the horse must stand still while the rider leans down, opens the mailbox, retrieves the mail, and closes the mailbox. I was surprised when she flinched and acted surprised, but then I remembered that we hadn’t done this before while in the saddle. I remembered trainer Mitch Hoover’s advice of just waiting at an obstacle and giving the horse time to relax. I decided to incorporate my “horse-breathing” even though Lexi was holding her breath. After I felt her relax enough that I could feel her breathing, I opened the mailbox. She made a very small flinch so I waited a little longer and tried again. This time she was perfect!